ANOTHER HOTLY tipped awards favourite is released this week as we enter the best time of year for going to the cinema. With its central themes of sports, fraternal relationships, and patriotism, Foxcatcher has all the makings of an Oscar winner. However this is more than your typical sports biopic. Moneyball was the last film directed by Foxcatcher director Bennett Miller and was a surprise multi nominated hit at the Oscars in 2012 and is still a really underrated movie. A baseball film which featured almost no baseball, it was about analytics and how to win at an unfair game. Bennett took a section of a book written by a financial journalist Michael Lewis, about money and baseball statistics, and turned it into a captivating, warm, film with personality and heart. When Foxcatcher debuted in Cannes last summer it was nominated for the Palme d’Or and won best director for Miller, so it seems like he is on to something here as well. Foxhunter is similar to Moneyball in the sense that Foxhunter is a movie about wrestling that is not really about wrestling. It is about the relationships of three very different, awkward men, how they confront adversity, and how they deal with one another. It is unsentimental, quite dark, and based on true events, leaving viewers with a rather unpleasant feeling. It is also a deeply strange story and so well put on screen by Miller, you’ll do yourself a disservice by reading about it on Wikipedia rather than watching the surreal events unfold on screen. The film opens with Mark Schultz (Channing Tatum ) giving a talk to some uninterested primary school students about wrestling in the Olympic Games. He is awkward and uncomfortable speaking on stage, he walks hunched over like a gorilla, uncomfortable in his skin, and clearly very insecure. Mark is the younger brother to Dave (Mark Ruffalo ), the far the more confident and outgoing of the two, who is also married and seemingly happy with his modest life. Within the first 15 minutes there is a silent wrestling match between the brothers with shows you everything you need to know about their relationship. Bennett really understands silence and sound. For a man who has only directed four films he has an incredible confidence to let the actors movements and background speak for themselves. Mark is propositioned by billionaire plutocrat John DuPont to train on his ranch for the upcoming world championships and from there a strange and unusual relationship develops between the Shultz brothers and DuPont. 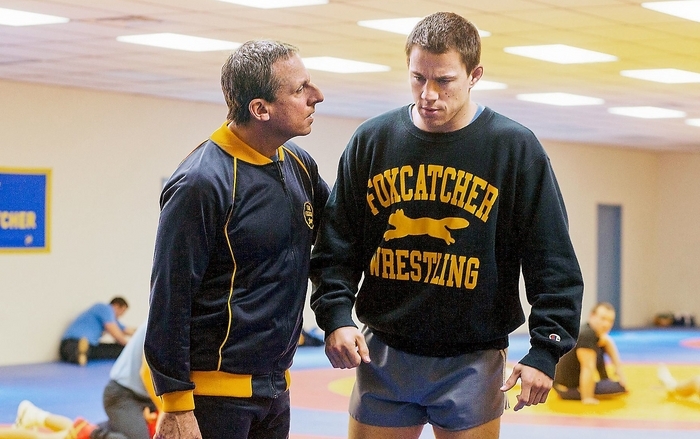 Foxcatcher works so well due to the performances of the three leads. Steve Carell (DuPont ) delivers a performance I honestly did not think he had in him, finally stepping out of his comfort zone. Physically he looks almost unrecognisable with a large fake nose that looks silly in trailers and on the poster, but you hardly notice during the film. Tatum is quietly enjoying a ‘McConaissance’ like career revival, showing his talent as a physical actor (not in the same way he did in Magic Mike! ). It is really impressive when an actor can convey confidence with just his movement, and even more impressive when an actor, who displays huge confidence in real life (like Tatum ), can pull it all back so we have pity for him when watching him eat some noodles. It really should be a career altering performance from both Carell and Tatum and I’m looking forward to seeing what they do next. Ruffalo has the easiest role of the three but he still brings something to it. He has an ease and likability in every movie he is in and here is no different. He almost seems out of place surrounded by empty vessels and troubled souls. Against the background of a beautiful autumnal Pennsylvania, Miller barely has to try. Although the movie takes place over several years it seems to be constantly approaching winter and leaves you with a sense of uncertainty and foreboding. The titular Foxcatcher ranch has as much personality in the film as the main actors and its presence, empty and cold, looms large over the events. When this film is over you will not be rushing back to see it again, but it will stay with you for days. It is maybe 30 minutes too long but otherwise well worth the ride.